​Priyanka Agarwal received a B.A. in Mathematics from Delhi University in India and a M.S. in Mathematics from Purdue University. She worked with a business analytics firm as a market forecaster in the past helping customers like General Electric. Following her passion for mathematics education, she worked as a mathematics instructor for at-risk students in India and with a community college in Fort Worth, Texas, where she was engaged in the remodeling of instruction and curriculum structure. The challenges faced during these times motivated her to return to academia to further explore her ideas and research interests. 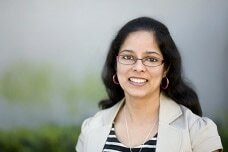 Priyanka is currently a doctoral student in the University of California, Irvine’s School of Education with a concentration in Learning, Teaching, Cognition, and Development (LTCD). Her research interests stem from her belief that if we dig deep, mathematics will reveal itself in the foundation of every undertaking. Domina, T., Lewis, R., Agarwal, P., & Hanselman, P. (2015). Professional sense-makers: Instructional specialists in contemporary schooling. Educational Researcher. Sengupta-Irving, T., & Agarwal, P. (in press). Conceptualizing perseverance in problem solving as collective enterprise. Mathematical Thinking and Learning. Agarwal, P., & Domina, T. (under review) Outward and inward attributes of school change: A mixed-method study of three school districts. Agarwal, P. (under preparation). What is mathematically productive about equitable engagement and what is equitable about mathematically productive engagement? ​Domina, T., McEachin, A., Hanselman, P., Agarwal, P., Hwang, N., & Lewis, R. (under review). Beyond tracking and detracking: The dimensions of organizational differentiation in schools.